A 12x9-inch combination equatorial and polar dial made of stainless steel and titanium. Solstice and equinox lines are shown on the polar dial face. This sundial is located in the park behind the old county courthouse where the Lindburgh baby kidnapping trail was held. Horizontal dial with an intricately hand cut stainless steel gnomon with a cast bronze dial face. The shadow casting style is the lower edge of the large gnomon. A second short gnomon indicates solstice and equinox dates. Dial sits atop a 700 lb stone pedestal base. A horizontal dial 12 feet across made of concrete and pipe. A horizontal dial of cast brass or bronze with a 2-foot diameter dial face showing hours in Roman and Arabic numerals. Coordinates and EOT corrections are shown as is the university motto, "Georgian Court: Bonitas, Disciplina, Scientia." Sundial face is also the sun in a scale model of the solar system, with the planets depicted in brass plaques placed at to-scale distances. 12 in diameter horizontal dial with very elaborate engraving on the bronze dial plate. In the center is a 32 point compass rose. Hour lines are corrected for gnomon width. The Equation of Time chart is engraved inside circle of hour lines with Roman numerals, which extend 4Am-8PM. At the south end of the gnomon is engraved 'R Glynne Fecit'. This appears to be a copy of dial by Richard Glynne, an 18th century dialist. Pedestal is a concrete spiral. 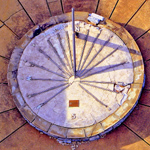 A ground level horizontal dial constructed from a rim of ten interlocking concrete pieces each 33 inches long. The interior is filled with an irregular concrete pieces whose edges form the hour and half-hour lines. The gnomon is iron, 51 inches from base to tip of style. The gnomon interior has a bronze statuette in the shape of a griffin taken from George Washington's coat of arms. The dial was stolen and replaced in early 1980's. Circular vertical dial about 10 foot diameter on stone wall with bronze gnomon and substyle. Dial declines 23° east of south. Hour lines every half hour. Arabic hour numerals with 12 Zodiacal signs. White marble 5x5 foot vertical dial declines 23° E with metal gnomon. Sits atop 12 foot cement pillar. Hour lines with Roman numerals are shown for every hour from 6 AM to 3 PM. North side of dial face depicts a tiger; donators Lee & Margaret Butler are named below with date 1983. A 22 ft high stone pillar dial, given by Sir William Mather, governor of Victoria University, Manchester, England, in 1907. It is a reproduction of the famous Turnbull dial of Corpus Christi College in England. This replica is the same as the one at Pomfret School, in CT. (#84). It was unveiled by Woodrow Wilson in 1907.